Dennis Vernacchia, N6KI – In MARS bunker 50 years ago. On Wednesday, April 10, 2019, the Delaware Valley Radio Association monthly meeting will feature a presentation titled “Calling Home from the Vietnam War, Ham Radio’s Role”. 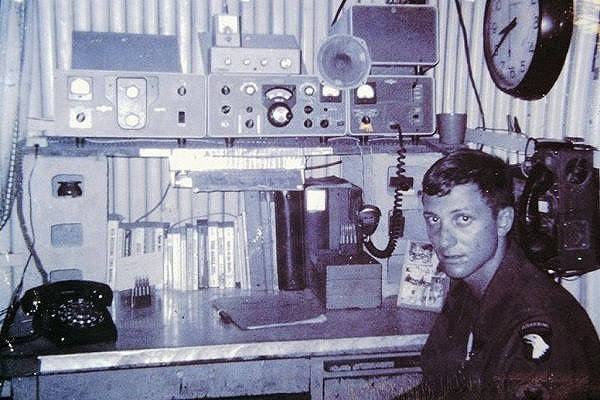 This is a first-hand story of how the building of a Ham Radio inspired MARS Station, during the Vietnam War, played an important role for soldiers’ morale and kept Dennis, N6KI, mostly, out of harms way. The slide/audio presentation, shows how, when drafted by the U.S. Army in 1967 and trained as a rear echelon radio-teletype operator, then shanghaied into an elite unit of the 101st Airborne Infantry Division, Dennis ingeniously worked to stay alive and preserve his mental sanity during his 12 month tour of duty, by keeping soldiers in touch with their loved ones using “Radio-telephone Phone Patches” on the 15 and 20 meter HF bands. How Dennis used his ham radio learned skills acquired as a teenager, and “Yankee Ingenuity” resurrect a failing Army MARS station at a remote and isolated Fire-Base, that was often under attack ! We guarantee that all who attend will enjoy,….. “The Rest of the Story”. Dennis’ talk is about how hams who served in the U.S. Army during the Vietnam war were vital in making the not so very well run Army MARS program successful in getting radio-telephone phone patches to their family, friends and loved ones back to the states. The U.S. Army did not have MOS job assignments for MARS Operators like the Air Force and Navy/Marine did. If you got an assignment as an Army MARS operator it was “Catch-as-catch-can” – you could not enlist and get that assignment!! Also, obtaining and maintaining equipment and antennas was often difficult. Yankee ingenuity and midnight requisitioning prevailed to keep Vietnam Army MARS stations on the air! Many of the US Army MARS Operators were DRAFTEEs like Dennis and that LUCKY assignment for hams getting into the MARS stations may have been responsible for saving their lives, if not,…..at minimum, their mental sanity, especially when assigned to a combat unit. Dennis’ story, which will be very similar to other Vietnam Army MARS Operators experiences, includes color slides and audio snippets of actual phone patches that occurred at the height of the war in 1968-1969, and details how a ham that should have wound up in a cushy and safe signal corp assignment, got shanghaied into an elite airborne infantry combat unit ( 101st Airborne Div) and put into harms way, survived and built a successful MARS station operation at an isolated and often attacked Firebase, 90 miles in any direction to any friendly forces. Slides will also include a few from Barry Goldwater’s MARS station where Dennis volunteered to run patches back to Vietnam when he came back to the states and also a few slides where my lifetime ham fried and funny Hollywood Comedian, Garry Shandling, WA7BKG/KD6OY (unfortunately we lost Garry in March of 2016) even played a role in keeping my MARS station, “AB8AY”, on the air with his and his family’s support. AB8AY went from a failing sandbagged 6X6 foot metal CONEX shipping container bunker, using a dilapidated and barely working 2 band Cubical Quad antenna and poorly working Collins KWM-2 Transceiver to a 15 X 30 ft permanent structure and 2 new KWM-2As with 30L1 amps and 2 new Hy-Gain LP-1007 Log Periodic antennas by the end of my tour/effort. No one will sleep thru this 50 minute presentation ! Dennis has lived in San Diego since 1974 is now involved in elmering new hams, can usually be found contesting on the HF Bands most weekends and also training aspiring contest operators.